I have registered for my first (possibly also last) marathon. It will take place in Okinawa on the 19th of February next year. I’m super excited and super terrified all at the same time. I had hoped to get into the Tokyo marathon to be my first 42 km race but unfortunately, my number did not come up in the lottery. My second choice was Osaka and again, I failed to win that lottery too. 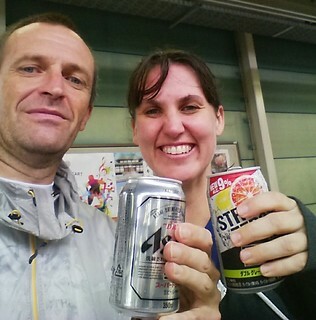 So I found the Okinawa Marathon which must be a lot less popular because there was no lottery involved! I registered for the race at home and the very next day, applied for my personal day from work for Monday 20th February as I’m pretty sure, I’m not going to be able to stand up. Reminded of my denial for Tokyo! Yesterday I had my first big test. 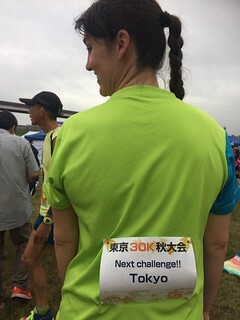 A 30 km training race in Tokyo. Jim (one of my marathon trainers) tells me that 30 km is the half way mark of a marathon! My 30 km was a mixture of success and defeat. Success because I managed to run further than ever before. 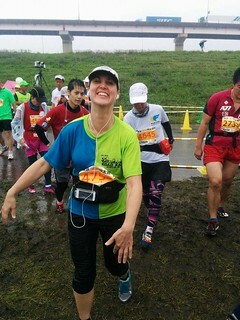 I ran for the best part of 25 km with just a bit of walking at the aid stops to eat my gels. I felt better than I had during a long run for a month! At the 22 km mark, I really thought I was going to make it the whole way. I had a smile on my face almost the whole way. At the 23 km mark, I started to feel the beginning of some cramping in my legs which slowed me down but was still manageable. I still thought I was going all the way. Defeat because at 24 km it started to bucket down. I hoped it would be just a brief shower and then I could dry off but it kept on raining. By 25 km I was soaked through and my iPhone had given up the ghost. Here I started to alternate walking with running. By 27 km I was wet, cold and miserable. The smile had gone. I gave up. I was worried that Simon might be waiting for me in the rain at the finishing line but not worried enough to compel me to keep running. So I walked the last 3 km. Sorry Simon! I had toyed with the idea of running the last 1 km but after trying a few steps, I realised that I would be faster if I kept walking! Defeat because once reaching the finishing line (where Simon was indeed waiting for me), I had to collect my bag in the mud which contained nothing to help me. No towel, no change of clothes or shoes. Luckily I got a race shirt that I was able to change into but I was still soaked from the waist down. I’m so glad he waited for me! Simon and I were both starving but because of my inability to prepare for the conditions, I had to insist that we choose a restaurant for lunch that had vinyl seats. Luckily they are more common than not in Japan! I also had to borrow his towel for the train ride lest I leave an unfortunate sign of my wet pants on the cushioned seat. Most of the reason for my failure though has been due to a lack of motivation and an overall slackness on my part. I’ve counted 16 weeks back from the race which means I need to start getting really serious from the last week of October onwards. This week I will run a bit for recovery, next week I’m on the grade 7 expedition which will mean little opportunity to run but then, it is going to be all out for 16 weeks. Stick as best as I can to my training plan. It will be my priority. Above work (where possible) and social life. Back to no drinking. This has crept back into my lifestyle but it will be out again come the end of Oktoberfest … I mean October. I did six months last year so 16 weeks will be a piece of cake. Stick to a healthy diet. Basically this means avoiding the staff room at break time. This will also help with #1 as I will need to work through breaks if I’m going to devote my after school time to training. Get to the gym a minimum of twice a week. I’ve found it really hard to do this now that work has started but with the 20 minute workouts I got from Renee during the summer, there really isn’t any excuse. I’m going to need someone to come with me to Okinawa. I’m a bit worried about finishing the marathon without having someone there at the end to pour me into a taxi to get back to the hotel. I’m not sure I’ll have enough where-with-all about me to even remember that I am staying at a hotel. All the job entails is following my dot on the RunKeeper and turning up at the finish line about 5 hours after I start. I can’t guarantee that I’ll have dry pants so you’ll probably have to bring a towel. But that’s about it. Let me know if you’re interested!